There are a number of reasons why you might consider hiring corporate transportation for your clients. In fact, using a professional service can provide a myriad of benefits that are sure to wow your clients traveling to Santa Barbara for business reasons. Besides letting your clients know that you’re serious about business and you want them to ride in style, your business image can benefit in many other ways. Hiring a black car service, whether it’s to transport clients to and from the airport, take them on a wine tour in the Santa Ynez Valley, or simply transfer them between meetings, means that a professional chauffeur will greet them and take them where they need to be without any fuss. This is the kind of professionalism that can boost your image. Corporate transportation allows your clients to travel in style. They may be tired from a long flight, or a long day of meetings, and having a clean, luxurious car take them around makes them feel at ease. Hiring a black car service means hassle-free transportation wherever your clients need to go. Whether they want to explore Santa Barbara or need to get to LAX on time for their next flight, a professional driver will get them from A to Be without an issue. Convenience is key when it comes to impressing clients, both new and old. Business people are busy and having a chauffeur at their disposal saves them time. Corporate transportation prevents delays, delivering your clients to their destinations without delay. Whether your clients regularly fly in to do business or are landing at LAX or any of the other local airports for a weekend of networking, Silk Road Transportation has your covered. 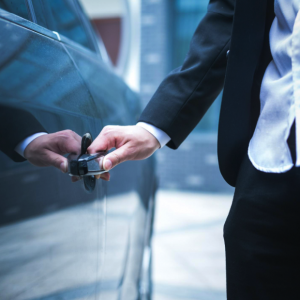 Our friendly and knowledgeable chauffeurs will be there on time, offering professional service every step of the day. Book stress-free, impressive corporate transportation today with Silk Road Transportation.